There are 2 days left until I pick a winner for the SpellQuizzer license. Be sure and send me an email, www.kimberlyw1@wildblue.net to get put in the drawing! Also, be sure and let your friends know. 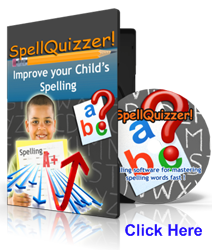 We will all be hitting the books soon and SpellQuizzer is a great resource for parents who are teaching their children how to spell. See my review here.